← The Grand Cork Experiment – stunt or science? They first caught my eye at love + labour’s natural wine tasting at Salut Wines the other week. There were several nondescript pouches of wines sitting on one small table, and it was largely that low-key presentation that piqued my interest. As you might perhaps expect from an importer called Vinnaturo, all these wines are natural – at least organic, and using “low intervention” winemaking. They are all packaged by the company in bag-in-box, bag without box, or keg, with the intention of reducing CO₂ emissions from transportation and keeping costs down. Bag alone is currently how they sell most wines. 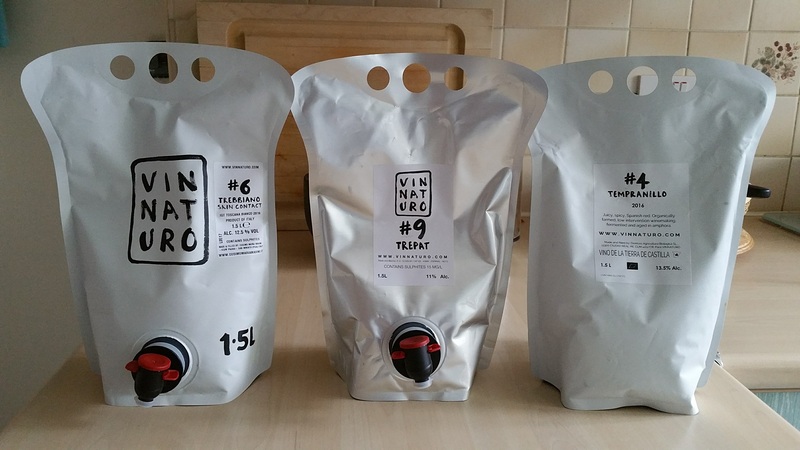 I shall leave it to others to consider how appropriate it is for natural wines to be packaged in plastic, but it is fine by me. I do however wonder if the presentation could benefit from being more standardised. The three wines I bought after the tasting had slightly different bags, different labels (click to enlarge the picture and read them), and different label positions. I like the idea of simple design, but this was close to just looking like no one cared. The same applied to the way they were delivered. They came in three separate boxes padded out with mountains of plastic chips and bubblewrap. Any one of the boxes would probably have been large enough to hold all three pouches, and the largest of the three boxes certainly would. The smaller boxes were very flimsy, one with a side torn open, and the tape holding the lid of the larger box was coming off. Doubtless most of the packing was reused, so not contributing further to landfill, and the pouches actually arrived in good condition, but it nevertheless did not give a great impression. For natural wines at least, I believe the presentation of the wines in bag is a USP, and I suppose all I am really saying is that a lot more could be made of it. Perhaps the on-trade is their biggest customer, and they do not care about such things? While in whinge mode, could I also say I would appreciate vintage information on their website? This does exist on some of the labels, and I would appreciate knowing the vintage, if only so that if I reorder I know I am getting the same wine. I was also looking in vain for best-before dates and advice on how long the bags last after opening. Unless things have improved vastly in the last few years, I know deterioration over a period of months can be an issue with this technology. Anyway, let’s now get down to the important business – the wines themselves. At the tasting, I tried all five of the Vinnaturo wines on show. Afterwards bought two of the ones I liked best, and additionally their skin-contact Trebbiano as I thought that sounded interesting. The prices given below are for the 1.5 litre bags I bought. Unless I say otherwise, assume they were tasted after pouring from my wine fridge at 12ºC. Also a quick reminder that my star ratings are for enjoyment at the time of tasting or drinking. Reassuringly, I scored the red wines the same in both locations: the love + labour tasting, and drinking at home. It does not always work out that way! So, a couple of wines I liked, including one I liked a lot, and one I didn’t like, which could easily be the outcome for a selection of three wines from any merchant. But Vinnaturo is very different in terms of image, and in the way it packages its wines. And despite my niggles, I still have a good feeling about their general approach, and I wish them luck, and hope to see them grow and succeed. Will I buy from them again? I think so – I would really love more of that Trepat. This entry was posted in My tasting notes and tagged amphora, natural, orange, tasting note. Bookmark the permalink. Steve how could one go about ageing the Vinnaturo, #4, Tempranillo for 5 years? I wondered if you had tried aeration or if the wine improved in the glass over a period of time? I have tasted these wines, at RAW in London. I am all for alternative packaging. Without taking anything away from what you tasted, my “go to” for bagged wine is the “du Grappin” bagnums from Andrew and Emma Nielsen’s Le Grappin. Good wines sourced in Macon/Beaujolais. John – You couldn’t age it for 5 years in the bag. No, I didn’t try aeration or leaving in glass. It was pure finger-in-the air stuff based on the tannins and quality of fruit. So, based on my admittedly limited experience and listening to people who know more than me. It is not really relevant here, but it is something I nearly always do when tasting. In many cases it is important from a practical point of view – to know when to open the next bottle. David – I’ll keep an eye out for those bagnums. Do you remember what you thought of the Vinnaturo wines? Just searched your blog with no success. Email me if you have a view but prefer not to say here.